©2015 David Cooper, President, Cooper Technica, Inc.
My company, Cooper Technica, Inc., has been privileged to work on some of the greatest automobiles ever made. At our workshops in Chicago, Illinois and in Lyon, France, we restore rare and valuable vintage European cars from the 1930s and 1940s. These specially selected cars embody the best of pre-WWII creativity and engineering genius. Because these cars are an important historical record, collectors and restorers share the responsibility to preserve these cars as much as possible in their original condition. Often the best option is to do a mechanical restoration only, and leave the body in its ‘as found’ state. However, some cars are too far gone to leave it ‘as found’. Either the deterioration is too extensive, or previous attempts at restoration destroyed or lost original components. For these cars, the question is, how to restore them to preserve as much of the original car as possible, and also to insure that the restored car is accurate and authentic to the original. To achieve the highest degree of authenticity and originality, we must be more than restorers; we must be meticulous automotive historians and dauntless forensic sleuths. Why? Because we cannot bring a car back to original without knowing what original was. We must learn how the car came to be in its current condition and configuration. Most of what we need to know cannot be found even in our extensive research library, much less in magazines or auction descriptions. This article tells the story of an exceptional 1943 Alfa Romeo. Part I describes our journey tracking the history and documenting the car. Part II, to be published in the next issue, will describe how, based on this research, we preserve original components while achieving unprecedented accuracy in restoration, through combining the latest laser scanning and digital imaging technology with the construction techniques and methods of the 1930s. To acquire, research and document the history of this Alfa Romeo, I crossed two oceans; sifted through private archives throughout Western Europe; and located and interviewed persons with first-hand knowledge of the car and other events from the 1940s. Admittedly, this is an extreme approach, but to do justice to the most valuable cars, it is more than justifiable: it is essential. A friend alerted me to a rare Alfa Romeo 6C2500 Super Sport that was for sale in Christchurch, New Zealand. Someone had made the bare beginnings of a restoration, and the car was for sale “as is”. Before the current owner brought it to Asia, the car had been owned by a Los Angeles collector for many years, during which it was painted red and disguised with a grille from a later Alfa 1900 model. Photo: 1943 Alfa Romeo 6C 2500 Super Sport Cabriolet in California in 2000 with the later type 1900 grille and extra headlights added in 1953. Photo courtesy of David Cooper. When I arrived in Christchurch to inspect the car, I found it entombed amid boxes of its own disassembled parts, with more of the same stacked on nearby shelves. As difficult as it is to evaluate a car in that condition, that’s my specialty. Once the boxes were off the car, I observed that the paint had been stripped from the aluminum body, and that weld lines betrayed modifications and repairs made over the years — including one bad repair with fiberglass. Panels were badly dented, and one front fender was cracked where it met the cowl — an evident stress point in the body design. Photo: 1943 Alfa Romeo 6C 2500 with parts in boxes in the container being shipped from New Zealand to Chicago. Photo courtesy of David Cooper. Even then, the car presented mysteries. Though the 1900 model narrow grille was mounted in a steel panel, the rest of the body was aluminum. Underneath the steel panel, I could see the mounting holes for the original horizontal grille slats. Evidently, the aluminum hood had been modified to accept the taller and narrower 1900 model grille — but when, and why, did that happen? In any case, having made a thorough inventory of all the parts and taken extensive photos, I concluded that the asking price was reasonable — despite the car’s condition. I bought it and had it shipped to Chicago. Photo: 1943 Alfa Romeo 6C 2500 arrives at Cooper Technica in Chicago. Photo courtesy of David Cooper. Since we had the chassis number the first step was to check Alfa Romeo’s own records, which showed the chassis was completed on December 9, 1942; the body completed on October 26, 1943; and the original owner as Luftwaffe Field Marshal Wolfram von Richthofen. The car was one of the 28 Alfa Romeo cars made during WWII—only for Mussolini’s close friends and associates, mostly high-ranking German officers. All were 6C2500 Super Sports with a short wheelbase chassis for better handling and a more powerful three-carburetor 2.5 liter engine. 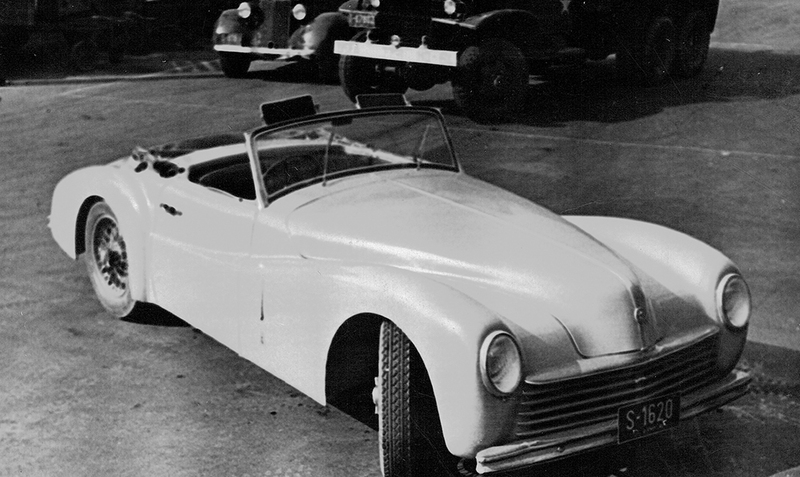 Seven had custom cabriolet bodies by one of the great Italian coachbuilders, Pinin Farina. Our car was one of them. Pinin Farina had developed two important innovations in the late 1930s: a standardized and cost-effective lightened steel structure that could be easily adapted to different aluminum body shapes; and the series of car designs that began integrating the fenders cleanly into the main body, smoothing the body shape and pioneering a new post-war look. The Pinin Farina designs were profoundly influential on all car designers worldwide through the 1960s, including that of Porsche, Jaguar, Ferrari and various American Marques. Alfa Romeo's files also contained two photos of the car, taken in Milan in front of Castello Sforzesco. However, these photos were in fact of a different car. How could I tell? Certainly the car in the photos was similar to ours, but its fender shape was slightly different, and from the 3/4 view photo, I could see that hood and grille were different, as well. Evidently, Pinin Farina had made two very similar cars. As it turned out, the other car, made a few months later than my car, did not survive the war. Had we attempted to restore our car to match the car in Alfa’s photos, ours would have had to be modified and distorted. In the end, after digging through many other archives, I found a number of original photos of our car, which allowed me to distinguish its unique design features. I found a series of three taken during the 1948 Mille Miglia, which showed a car coming into the Florence checkpoint bearing race number 224 on the front fender. Race records confirmed that car #224 had my chassis number. I then identified the driver as Spartaco Graziani of Livorno, Italy, who finished the 1948 Mille Miglia 3rd in class and 22nd overall. The cars that raced in the Mille Miglia are prized today because they are automatically eligible to run the re-created Mille Miglia rally. However, I knew that everyone in Italy was familiar with the Mille Miglia and huge crowds gathered to watch the cars speed by. “You watched the race?” I asked. Of course, I persuaded him to sell me the diploma so we could reunite it with the car. It is the hand-lettered and colored Official Certificate furnished to Spartaco Graziani, stating his finish time and engine position in the 1948 Mille Miglia. These certificates are very rare, and are almost never reunited with the original car. I sent the Diploma to a paper conservationist and had it carefully washed, ph-balanced and framed in an archival frame under special UV resistant glass. Original hand-lettered Diploma from the 1948 Mille Miglia. Graziani finished 3rd in class and 22nd overall with a time of 17 hours, 8 minutes, 46 seconds. Photo courtesy of David Cooper. Meanwhile, I contacted the von Richthofen family for more information about Wolfram von Richthofen. Like his first cousin, the infamous Red Baron of World War I, Wolfram was an ace pilot. He flew in the Condor Legion during the Spanish Civil War; and in World War II became the youngest Field Marshal in the history of the German armed forces. He ordered the Alfa Romeo in 1942 while he was stationed in Italy, managing the German air campaign in the Mediterranean. An avid car enthusiast, he owned several sports cars besides the Alfa Romeo. I continued my research through various private archives in Europe. After von Richthofen’s death in 1945, the family sold the car to an American serviceman. I found eight photos of it bearing U.S. Army plates, taken on an American base in Europe in late 1945. These photos are invaluable, as they show the front, rear, interior and dashboard of the car. It was the serviceman who sold the car to Spartaco Graziani, who raced it in the Mille Miglia and eventually sold it to another American who, in turn, shipped it to the States. Photo: 1943 Alfa Romeo 6C 2500 on a U.S. Army Base, 1945. Photo courtesy of David Cooper. Finally, a few months ago, I searched a cache of photos taken by German photographers during the Italian campaign. They show soldiers at leisure, hanging around, playing cards, eating meals, playing sports and looking at cars. In this collection were four photos dated September-October 1943, showing the Alfa Romeo when it was first delivered to von Richthofen. Taken at a workshop in Italy, two of them capture a mechanic examining the engine wearing a type of Luftwaffe side cap used only in 1943. The car even had blackout headlights for wartime use. Photo: 1943 Alfa Romeo 6C 2500 in a photo taken in October 1943 when it was first delivered to Wolfram von Richthofen. Used by permission granted by Agence d'images ECPAD, www.ecpad.fr. Item number: LFT2 F1590 L32. 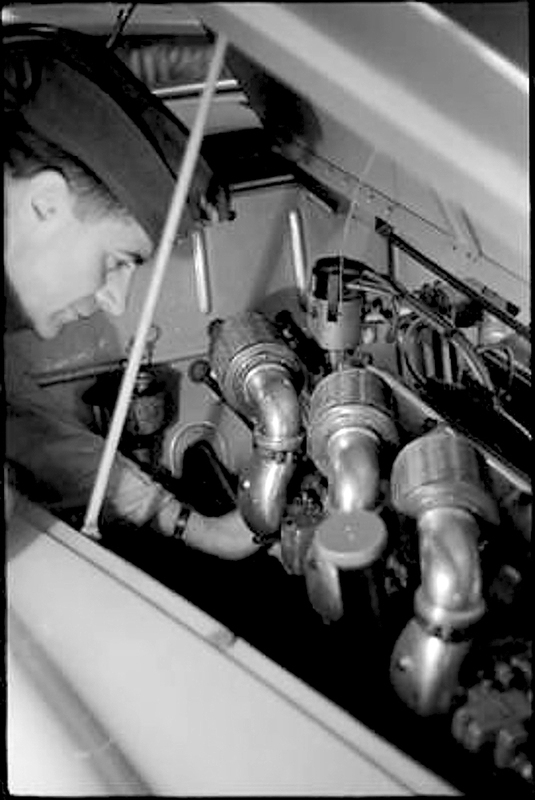 Photo: Luftwaffe mechanic examining the engine of the 1943 Alfa Romeo in a photo taken in October 1943. Used by permission granted by Agence d'images ECPAD, www.ecpad.fr. Item number: LFT2 F1590 L23. With these original photos, from 1943, 1945 and 1948, we now have full knowledge of the Alfa Romeo as originally built. We also can see how it was repaired or modified at different times during its history. This information is critical to make the patterns we need to preserve the original sheet metal body panels while bringing them back to their original shape and dimensions. Part II will describe how we combine the latest laser scanning and digital imaging techniques with the traditional construction methods of the era, to restore the Alfa Romeo to its original shape within an amazing 2mm — a level of accuracy never before possible. 1 This article was adapted from a presentation by David Cooper at the October 2014 Historic Vehicle Association (HVA) National Automotive Heritage Summit, convened in Washington D.C. in conjunction with the Smithsonian Museum. The subject was how Cooper Technica’s painstaking research and innovative restoration techniques allow it not only to preserve original components, but also to achieve unprecedented accuracy in restoration. The example presented was a 1943 Alfa Romeo 6C2500 Super Sport Cabriolet now under restoration. Cooper Technica has been privileged to restore some of the finest automobiles ever made. The company specializes in the complete restoration of rare and valuable pre-war and early post-war European cars. Both aesthetic and mechanical restoration, including custom precision fabrication, is performed in-house in Cooper’s Chicago and Lyon studios. The level of restoration and forensic analysis is unequaled. Cooper Restorations are based on in-depth historical research, accurate and verified provenance, and understanding the car’s context and milieu. The company’s methods and equipment span the 1930s to state-of-the-art laser scanning, digital imaging and 3D printing. Adherence to original materials, chemistry, metallurgy and period production techniques is essential to restore these fine cars to original specifications. David Cooper founded Cooper Technica, Inc. in 1989 in the tradition of fine artisans and old world craftsmanship. Cooper personally oversees all aspects of production, design, research, management, marketing and sales. David Cooper apprenticed under a master craftsman for eleven years after a decade in engineering and marketing in the corporate world. He is a third generation trained fabricator, machinist, and machine designer. Cooper is a published automotive historian, lecturer, writer and consultant to museums, collectors and investors.